TAI, the leading enterprise of the Turkish Aerospace Industry, displayed its unique products at IDEF 2017. The T129 “Atak” Helicopter was demonstrated previously at various events and used effectively by the Turkish Armed Forces. It was exhibited once again at the area specially allocated to it, the “Anka” Unmanned Air Vehicle was unveiled, equipped with the critical payloads simultaneously for the first time. In addition to the SAR Radar, “CATS” Electro-Optical Reconnaissance Surveillance and Targeting System, the 2.75’ Cirit Missile and its launcher and MAM-L missiles’ developed for the first time by Roketsan were demonstrated over a platform. TAI displayed for the first time the Synthetic Aperture Radar (SAR), “CATS” EO Reconnaissance-Surveillance and Targeting pod, 2.75 “Cirit” missile and launcher as well as MAM-L missile together on the ANKA UAV. The first prototype of the T625 Multi-Role Helicopter was amongst the surprises of IDEF 2017 with the “Hürkuş” . The simulated mock-up of the Turkish Fighter (TF) project of which the design activities have been proceeding rapidly, was also displayed for the first time at TAI’s pavilion. On the first day of the Fair, Prime Minister Mr. Binali Yıldırım and Minister of National Defense Mr. Fikri Işık visited the TAI stand hosted by TAI Chairman Prof. Oğuz Borat and TAI President & CEO Temel Kotil, Ph.D. Prime Minister Mr. Binali Yıldırım and the accompanying delegation were informed about T129 “Atak” Attack and Tactical Reconnaissance Helicopter, T625 Multi-Role Helicopter, Hürkuş-C New Generation Light Attack/Reconnaissance Aircraft and the configuration of “Anka” Unmanned Aerial Vehicle System on the ammunition was fitted. On the second day of the Fair, a memorandum of understanding was signed at the TAI stand with the leading civilian and military aerospace company of the Ukraine, Antonov, for the development and joint production of the UAV System. 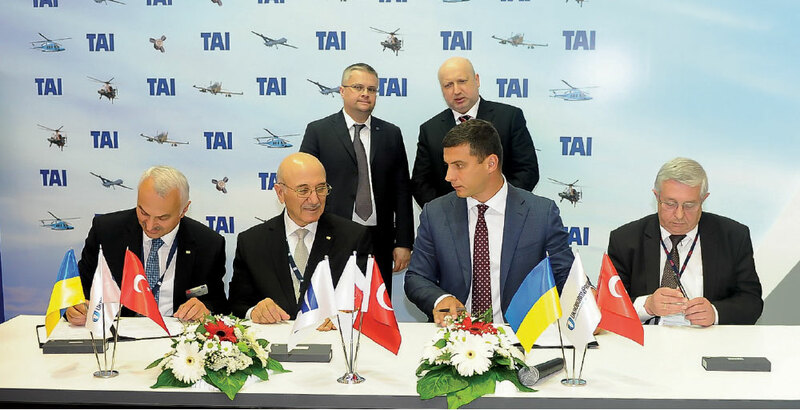 The signatures were given by TAI President and CEO Temel Kotil,Ph.D; General Manager of Antonov Mr. Oleksandr Kotsuiba, TAI UAV Systems Group Head Mr. Ömer Yıldız and Antonov Marketing and Sales Deputy General Manager Mr. Yuliy Kyselov. At the SSM signing ceremony, Pakistani Aeronautical Complex (PAC) and TAI signed Memorandum of Understanding (MoU) for cooperation in the field of aerospace under the witness of Pakistan Defense and Production Minister Mr. Tanvir Hussein and Minister of Defence Mr. Fikri Işık. The signatures were given by TAI President &CEO Temel Kotil, Ph.D and PAC Chairman of the Board Mr. Arshad Malik. During the second half of the day, two crucial signatures were given regarding the Turkish Fighter Program (TF-X) at the TAI stand. On behalf of Turkey, the Undersecretary for Defense Industries Prof. İsmail Demir and on behalf of United Kingdom Head of the Defense and Security Organization (UKTI DSO) Mr. Stephen Phipson signed the TF-X Program Turkey-BAE Exchange of Letters Memorial Ceremony certificate. The memorial ceremony was realized with the participation of Air Forces Command Major General Abidin Ünal, British Ambassador Mr. Richard Moore and distinguished guests. Following the Heads of Agreement document inked between TAI and BAE Systems on January 28, 2017, the Letter of Agreement, which identifies the status reached by the parties after the completion of the negotiations in order to initiate the approval process under the Collaboration Agreement, was signed between TAI and BAE Systems at the IDEF fair. The signatures were given by TAI President & CEO Temel Kotil, Ph.D, TAI-Turkish Fighter Group Head Prof. Mustafa Cavcar, BAE Deputy Director Mr. Tom Fillingham and BAES MAI Chairman of Board Mr. Michael Hasnip. The joint activities such as engine selection, conceptual design review, infrastructures, etc. were carried out with BAE systems in addition to contract negotiations within the scope of pre-contract activities referred to as “Pre-Contract Study” (PCS). On the second day of the Fair, a “Collaboration Agreement” was also signed between TAI and Malaysia’s largest Defense Industry Company DEFTech-DRB-HICOM Defense Technologies Sdn Bhd in order to meet Malaysia’s need for Unmanned Aerial Vehicle Systems. The signatures were put by TAI President & CEO Temel Kotil, Ph.D, CEO of DEFTech Group Dato ‘Haji Amril Samsudin and TAI UAV Systems Group Head Mr. Ömer Yıldız. COO of DEFTech Group Major General Dato’ Pahlawan Zulkifli bin Mansor also signed as a witness. On the third day of the exhibition, important collaboration agreements were signed while the senior delegations visited the TAI stand. Qatar Defense Minister Khalid Bin Mohammad Al-Atiyye visited the TAI stand accompanied by TAI President & CEO Temel Kotil, Ph.D and inquired about the unique platforms from the TAI executives. The signature ceremony for the Hürkuş-C New Generation Light Armed/Reconnaissance Aircraft development and Mass Production Program was also realized on the third day of IDEF 2017 with the participation of Undersecretary for Defense Industries Prof. İsmail Demir at TAI stand. The contract between the Undersecretariat for Defense Industries and TAI was signed by the Undersecretary for Defense Industries Prof. İsmail Demir, TAI Chairman of the Board Prof. Oğuz Borat and TAI President & CEO Temel Kotil, Ph.D. Following the announcement of the RFP by the Undersecretariat for Defense Industries (SSM) regarding the New Generation Light Attack /Reconnaissance Hürkuş-C Development and Mass Production Program, SSM and TAI agreed upon the Framework Agreement. Within the framework of the Hürkuş-C Program, the hardware and software activities will be developed mainly by local facilities and integrated on the aircraft in accordance with the terms of reference and technical requirements to be agreed by the parties. Within the scope of the Project, a total of 24 Hürkuş-C aircrafts (12 optional), are planned to be procured. Hürkuş-C will be also equipped with local unique ammunitions such as LUMTAS, “Cirit”, TEBER, HGK, LGK; the INS/GPS guided bombs, general purpose bombs, unguided missiles and machine guns. 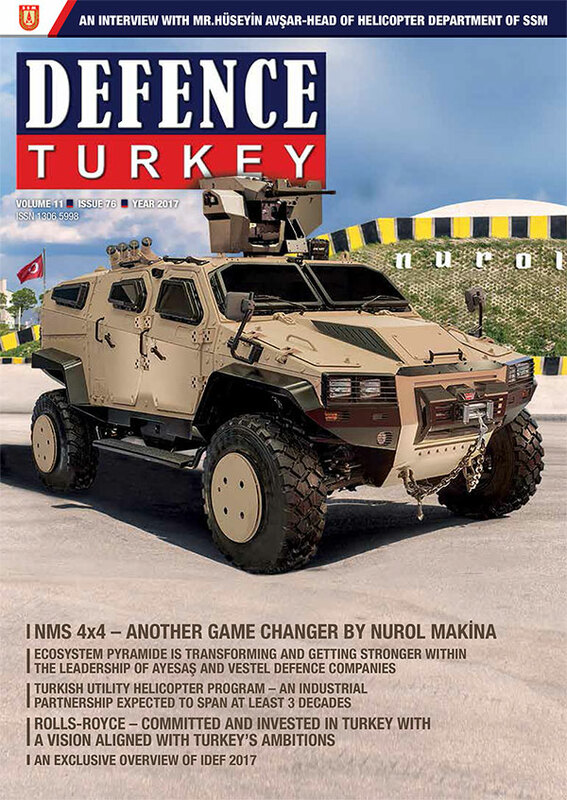 Having external fuel tanks to enhance the endurance for critical missions, the electronic warfare systems were also outfitted on Hürkuş-C against the MANPADS threats, and the internal fuel tanks were supported by self-repairing fuel tanks. The vital parts of the aircraft are protected by armors. The Hürkuş-C, equipped with an Electro Optical Camera capable of laser designation and surveillance at night and daytime conditions, will also be able to convey the video and data image to ground stations in real time. Within the scope of the ceremony, a Framework Agreement was also signed between TAI and Aselsan and Roketsan. The signatures were put by the Presidents and Chairman of the aforementioned companies. 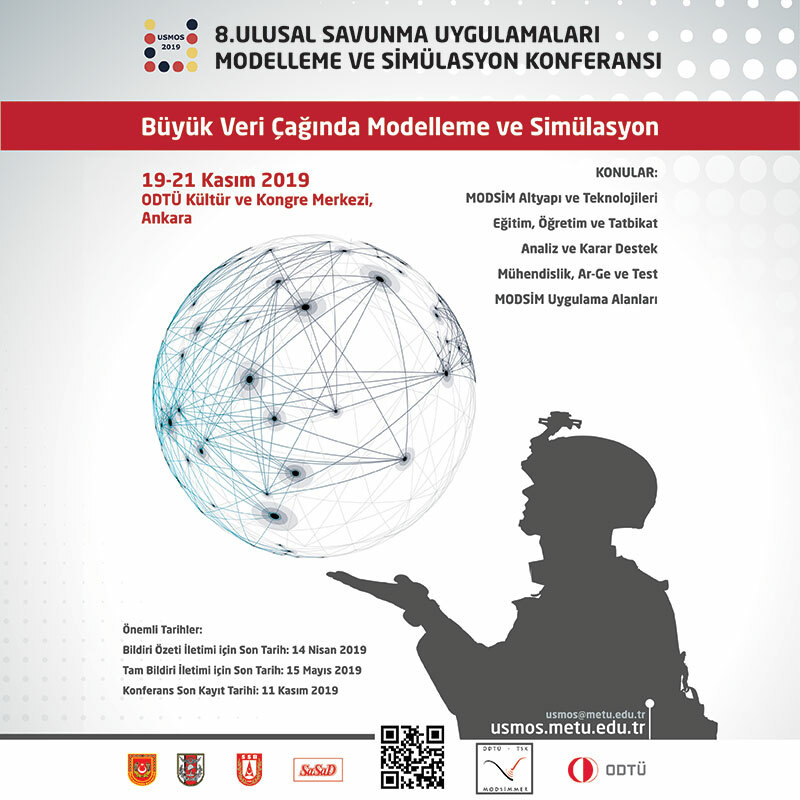 TAI and BİTES signed a “Memorandum of Understanding” with the aim of collaboration by bringing together the experiences and know-how in the field of Dynamic Simulation Software Frameworks and Simulation Software Infrastructures. TAI President &CEO Temel Kotil, Ph.D, TAI Satellite Systems Group Head Mr. Selman Nas and BİTES CEO Mr. Uğur Coşkun have signed the agreement in the behalf of the companies.